Children with a functional gastrointestinal disorder experience abdominal discomfort because the nerve endings in the intestines may be hypersensitive. This discomfort may lead to chronic abdominal pain, diarrhea, nausea, vomiting and/or constipation. However, growth and development are normal in children who have a functional gastrointestinal disorder, frustrating parents and children. There is no diagnostic test that readily identifies this issue, and no singular treatment that relieves the symptoms. 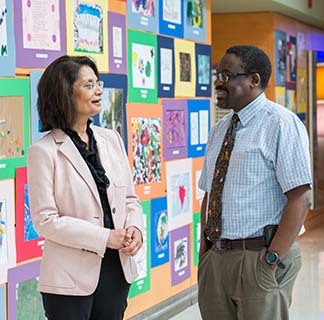 For children and families suffering from functional gastrointestinal disorders, our expert gastroenterologists at University of Chicago Medicine Comer Children's provide comprehensive care with individualized treatments for each patient's needs. At Comer Children's, your child benefits from the combined expertise of many of the nation's leading specialists in gastrointestinal diseases. Our gastroenterologists are nationally and internationally recognized for providing breakthrough care of complex digestive diseases.